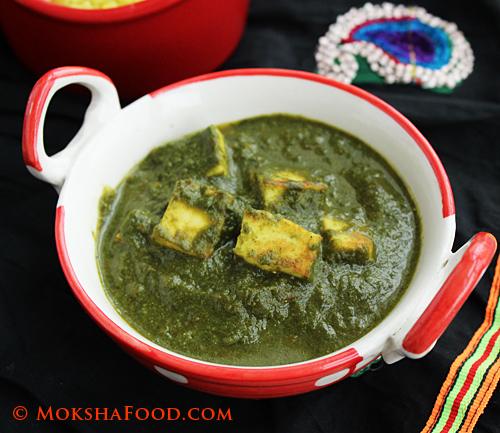 Healthy Palak Paneer: Cottage Cheese cubes in Spinach sauce! 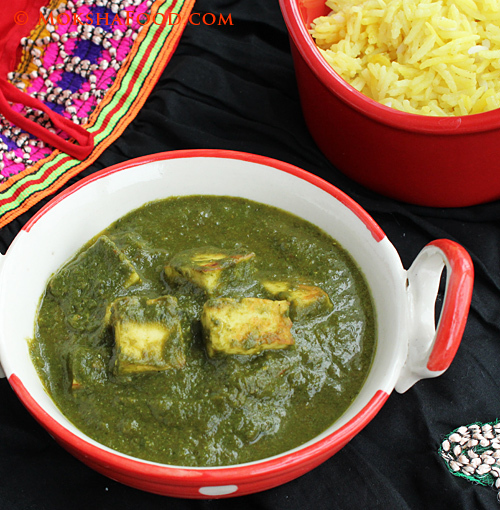 Cottage Cheese cubes in Spinach sauce is a Punjabi recipe popularly knows as Palak Paneer - A restaurant favorite which i make at home very often. Its my daughter's favorite way of eating spinach. 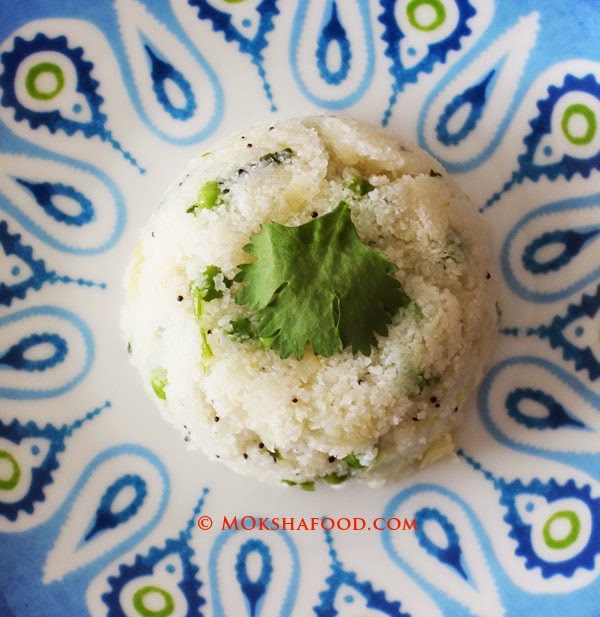 The goodness of spinach and cottage cheese makes it a very healthy combination. The restaurant kind has oodles of cream added to it. I mimic the same texture and taste with beaten yogurt. It adds a nice creaminess and tang to the sauce minus the calories. Also i don't prefer making paste of onions, ginger or garlic. I just chop and saute all of them together and then puree. It taste better and its way faster bringing this meal together. Enjoy it with your favorite flat bread or flavored rice or even added to pasta. Put a large pot of water to boil. Immerse the washed spinach leaves and blanch it for just 5 mins. Remove the leaves, cool and grind to a smooth paste. This is done to maintain the dark green color of spinach. In a large saucepan, heat 1 tbsp of oil to medium heat. Temper with cumin seeds and saute till they sizzle and let out a nice aroma. Add in the chopped onions and saute till light brown. Stir in ginger, garlic and green chilies. Now add in the tomatoes and cook till pulp. Add in all the spice pdr -turmeric pdr, cumin pdr and corainder pdr. Saute this mixture well for about 5 mins. Then Cool and blend to a smooth paste. Add this blended paste back to the pan. Stir in the spinach paste. Be careful while cooking now as the sauce can boil violently. You can add 1/4 or 1/2 cup of water to thin out the gravy if needed. Put a lid on it while it simmers and lower the heat. Add in the beaten yogurt, garam masala, salt and sugar. Taste to balance the flavors. In another flat pan, preferably nonstick, briefly saute the chopped pieces on paneer/cottage cheese in a teaspoon of oil till they get a nice brown spot on them. Don't overcook the paneer as it would make it very tough. 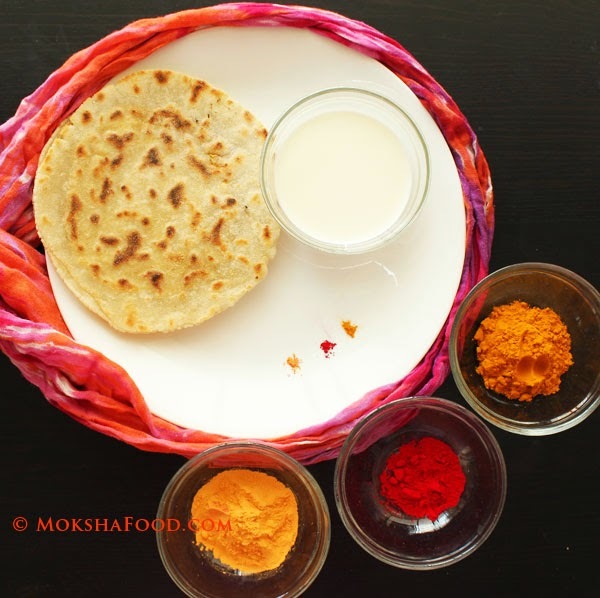 You can also choose to avoid this step and add the paneer pieces directly into the sauce. Add the sauteed paneer pieces into the gravy and simmer the sauce for at least 8-10 mins to let paneer absorb the flavors. 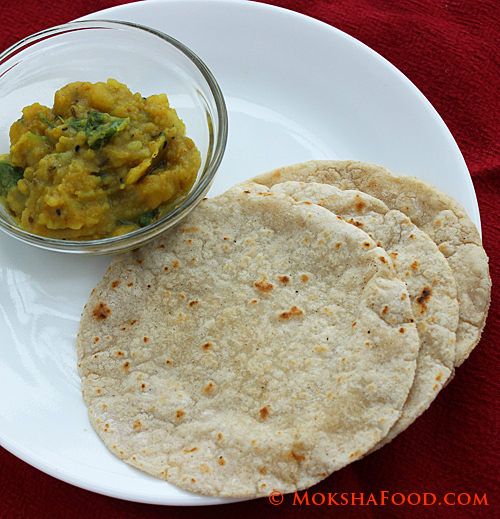 Serve hot with paratha(layered flatbread) or your favorite flavored rice.